Even though Indie and Brook are only 6 and 4 years old respectively we have managed to get through quite a bit of children’s luggage already. The girls have grown so quickly and this has definitely changed the type of girls suitcases that they need. We’ve learnt a thing or two about not only what to pack in our suitcases but also buying the right kids suitcase depending on age and the type of trip we are taking. With all this family travel knowledge, we have been scouring the internet in the hope we can save you both time and money when buying your new kids luggage. 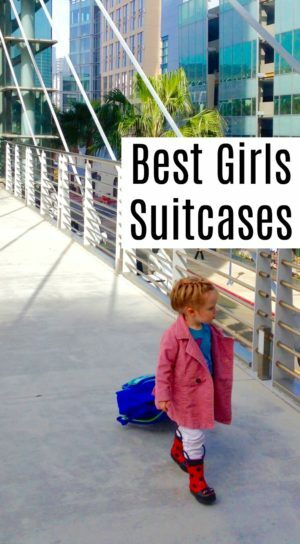 We are confident we’ve found some of the best suitcases for girls and we’ve rounded them up into one handy travel gear post for you. We also wanted to share a few family travel tips about buying girls luggage and how to get it right. If you are planning on lots of vacations with your kids, buying the right girls luggage is going to be a great investment for you all. It can be a lot of fun finding a suitcase for girls too! If you are new to travelling with kids you might be wondering what the benefits are to buying the kids their own girls travel bags. I’m convinced there are a few benefits, especially if you are planning on going on frequent family holidays. Having separate girls suitcases is a great way of making the most of your carry on baggage allowance when you are flying. As soon as you have to buy them their own seat on a plane at two years old, they are entitled to have their own children’s carry on luggage so your excuse to buy cute suitcases for girls starts right there. If you are only going on a short trip, or you pack very efficiently, a whole family could travel with just cabin bags for your summer holidays or city breaks. The kids will also be going on school trips before you know it so a little girls suitcase will come in handy in more ways than one. We have also found that having girls suitcases means that the kids are a lot more inclined to pack their own luggage. I’ve always been in charge of writing the packing lists in our house, and I know there are certain things the girls always like to take. Now they are old enough to pack their own toys, books, teddy and colouring sets in their suitcase all they need is a little prompting from me to get this job done before our holiday. Every little helps when you live in a busy house like ours. On the flip side, if they do forget something I can say to them that they had the chance to think about what they wanted to take and perhaps they need to think about what items they pack for a holiday a little bit more. Even if they are only packing children’s hand luggage, it’s still an opportunity for them to take responsibility for what they want to pack and think about the types of activities they want to do when they are on holiday. The other great thing about girls suitcases is they tend to be really easy to identify. If you know you are going to be spotting your suitcase on the carousel or picking out your luggage at the cruise terminal before the trip home, then a pretty patterned suitcase is going to catch your eye and the kids also have a better chance of seeing it. It could just make things a little quicker for you when you travel as a family and save any suitcase mix ups happening at the beginning or end of your holiday. Different kids suitcases suit different types of travel better. It’s worth thinking about the types of holidays and trips you are going to be taking over the next few years before you buy a girls suitcase. If you know you are going to be flying a lot then buying lightweight hard shell suitcases should definitely be a priority for your girls cabin case. You won’t have any trouble finding a girls hard suitcase that you like either. If you know that you are going on a lot of road trips in the next few years, then soft shell suitcases are probably going to suit your family better as they fit into the back of cars easier than hard cases. Being soft gives you the opportunity to squeeze them into those tight spaces in the boot and the unicorn cabin case is super cute isn’t it. Also, be realistic when it comes to the age of your kids and how likely they are to be carrying their own luggage through departure lounges and hotels. This is where ride on and scooter suitcases can really save the day as they are a lot more fun than pulling children’s suitcases on wheels. We have also found that we have changed or updated the girls luggage every two to three years while they are small. This is because they have outgrown their Trunki suitcase or their tastes have changed. For example, now they would really love the Matalan unicorn suitcase. I’m pretty confident that we will have to buy more pretty suitcases as they get older, but it’s worth remembering that things change really quickly while they are young. 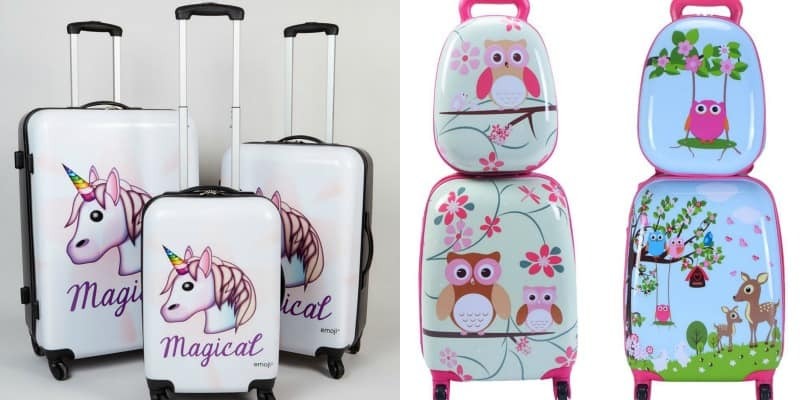 Brook & Indie have been helping me choose the best girls suitcases for our list and I think they have picked something for everyone from a great toddler suitcase to luggage sets for older girls. I’m a huge fan of the unicorn suitcase to be honest and can see us making a purchase very soon! What do you think of our list of girls suitcases? 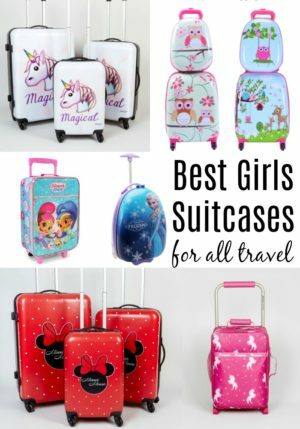 We also created a whole separate list for their favourite character suitcases and these ideas are great for young girls who travel a lot. 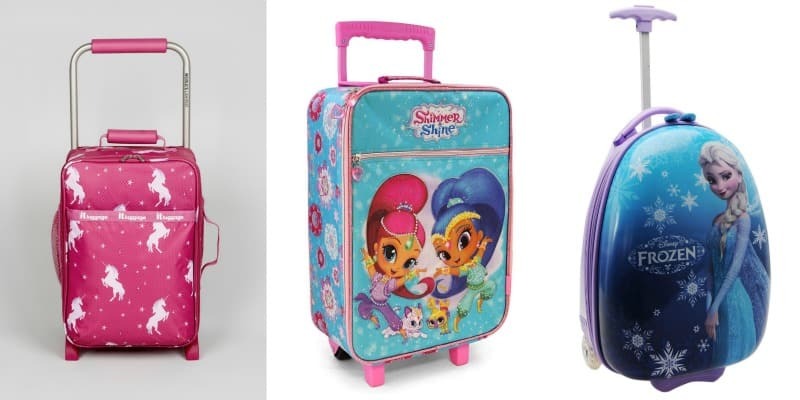 If you have a a little person who would love a new Disney suitcase or are looking for a My Little Pony suitcase, Brook & Indie didn’t want you to be left out. The Minnie Mouse suitcase from Amazon is really popular at the moment, but you might want a Mickey Mouse suitcase, especially for a trip to Disneyland or a large disney suitcase for the family. If they had their way I think we would have all of these girls suitcases and kids hand luggage on order right now. We all hope that you love our girls luggage suggestions. If you are thinking about updating the family suitcases do bear in mind our tips so you buy the right suitcase for your next holiday. Picking the right girls suitcases can be a great way of encouraging your kids not only to love travel but also learn the important skills that go into making great holidays and lasting memories. Whether it’s a girls pink suitcase or a minnie mouse cabin suitcase your new travel accessory is sure to become a much loved part of your family holidays for your next trip. This post does contain affiliate links, so if you love our suggestions and you decide to make a purchase, I might receive a few pennies at no extra cost to you. It’s a lovely way to support this website and we appreciate every single click.